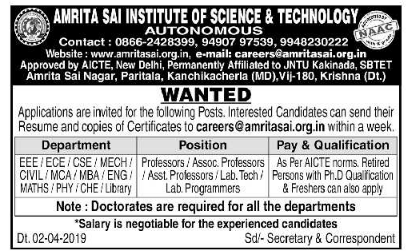 Amrita Sai Institute of Science and Technology, Krishna has advertised in the DINATHANTHI newspaper for the recruitment of Teaching Faculty- Professor / Associate Professor / Assistant Professor Plus Lab Technician / Lab Programmers / Librarian jobs vacancies. Interested and eligible job aspirants are requested to apply within a week from 02nd April 2019. Check out further more details below. About College: Amrita Sai Institute of Science & Technology (ASIST) was established in the year 2007 by "Amrita Sai Educational Improvement Trust". ASIST is a self-financing technical institution approved by All India Council for Technical Education (AICTE), New Delhi and Permanently affiliated to Jawaharlal Nehru Technological University Kakinada, A.P.